The Tule Mat Lodge was a typical structure used as a shelter or house style that was built by many tribes of the Plateau cultural group. 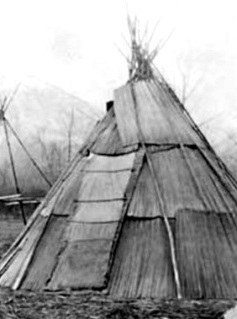 The Tule Mat Lodge was made using tule, a type of bulrush or reed, that grew in these areas. These types of Native Indian houses were commonly built in a similar style to tepees but covered with tule mats rather than animal hides. Learn about the structure and the interior of the Tule Mat Lodges with pictures and images together with facts and information about the tribes who used them, including the Spokane, Coeur d'Alene and Nez Perce Native Indians. What was a Tule Mat Lodge? Definition: A Tule Mat Lodge was a shelter or house that was constructed using mats made of tule, a type of bulrush or reed, that was abundant along rivers and marshes in the Plateau region of North America and Canada. The reeds, excellent thatching materials, were first dried and then woven into mats and used as coverings for pyramid shaped lodges like tepees. Tules were perfect for building temporary, portable structures as the mats could be rolled up and carried away. Tepees were covered with animal skins but the tule-mat lodge was covered with mats of strong, durable, tule reeds (bulrushes). Who lived in a Tule Mat Lodge? The Common Tule (Schoenoplectus acutus) is also known as the Hardstem Bulrush is found in northern and eastern North America, where the tribes of the Plateau cultural group lived. It has a thick, round green stem that grows between 3 - 10 ft (1 to 3 m) tall with long, grass-like leaves and pale brownish flowers. The stem, or stalk, of the tule is the part of the plant used in making a tule mat. Why was the Tule Mat Lodge chosen as a shelter or house style? Every tribe choose a type of housing to suit their lifestyle, the climate, the environment and the natural resources (known as biomes) that were available to them, and the tribes of the Plateau region were no different. The poles required for the framework of the lodge were selected from the coniferous trees that grew in the area such as pines, spruce, aspen, birch and fir. The Tule Mat Lodge was chosen as the most suitable type of housing because it suited the semi-nomadic lifestyle of the people and enabled them to quickly and easily move about on hunting trips during the summer. During the winter many of the tribes lived in villages of pit houses. 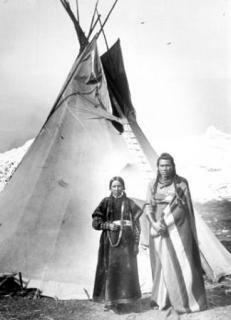 With the introduction of the horse many tribes travelled to the Great Plains and many replaced the tule-mat tent coverings with buffalo hides. In the late 1700's canvas became available and was acquired by some of the tribes through trade. How was a Tule Mat Lodge built? Tule Mat Lodge Interior consisted of a single room that was big enough to sleep several people. The floors were covered with mats or the hides of animals. Beds, consisting of dried grasses covered with animal hides, were located on the floor. A hearth was built in the center of the lodge for heating and cooking. The fire-pit was lined on the bottom and along the sides with stones. 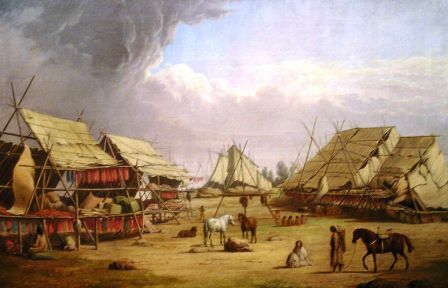 The picture, by artist Paul Kane (1810 - 1871) depicts the original Fort Colville trading post that was initially built using tule mats - the material the Plateau tribes used for their temporary summer shelters.